My grandmother, Margaret Cruden and her brother Stewart. Studio portrait probably from around 1914. My maternal grandparents David Skinner Ramsay and Margaret Cruden celebrating their 25th wedding anniversary. Ramsay family celebrating wedding anniversary. Children from left: Elizabeth, Sandra, Margaret, May, David and Catherine. Seated Margaret Cruden and David Ramsay. Ramsay family; circa 1942-43. Margaret Cruden (seated), Elizabeth, May, Catherine, Margaret (standing). David. Sandra seated in centre. My christening; four generations of strong women. 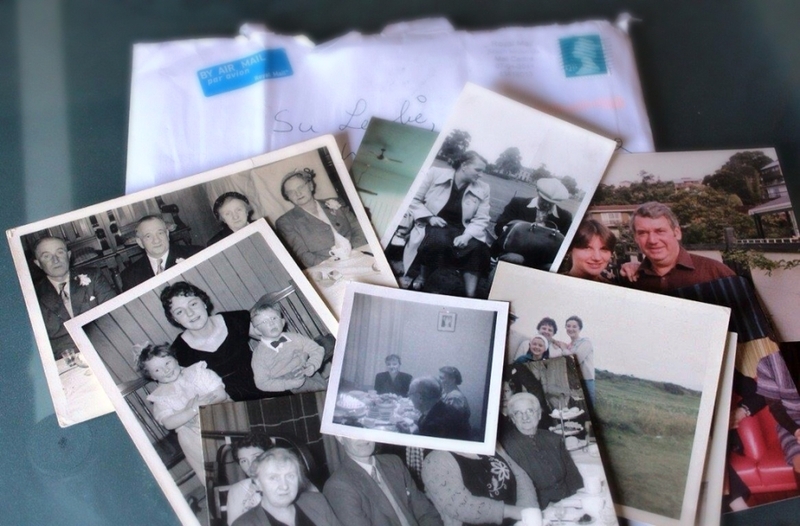 My mother, grandmother, great-grandmother and – as it turns out – me. 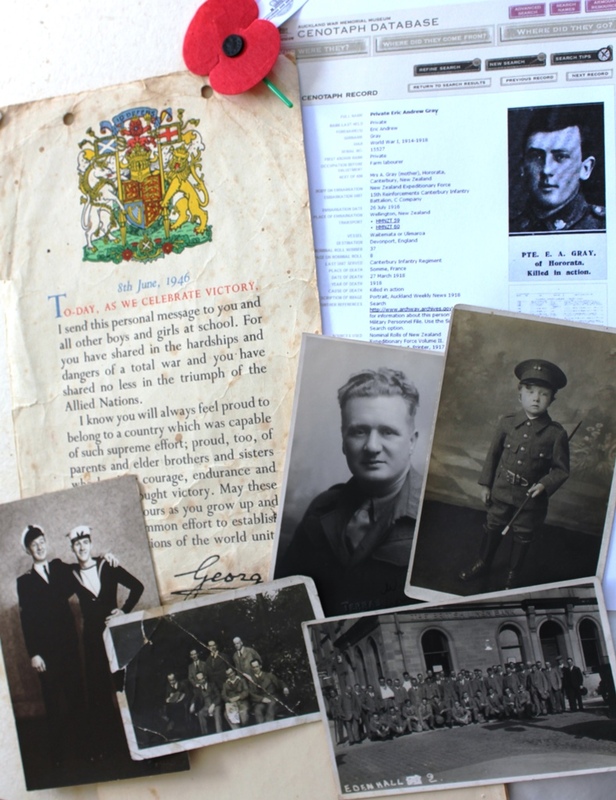 Snapshot of war: amongst the family photos, a few of those who served in the military and a letter from George VI to the children of Great Britain. As the boy-child becomes a man, I find myself reflecting on the suffering of my grandmothers and great grandmothers whose sons went off to war. My family seems to have been particularly blessed in that all but one of our men who served in World War I or II returned. My great grandfather was wounded in WWI, and lost a leg, but lived until 1970, raising five children and celebrating over 60 years of marriage to my great grandmother. The Big T’s great grandmother was less fortunate. Both her sons joined the New Zealand Expeditionary Force in WWI, but only one- the Big T’s grandfather Wallace Gray – returned, wounded and weakened by illness. His younger brother Eric Gray was killed in March 1918 in the third battle of the Somme. Like so many Kiwis, he is buried thousands of miles from home in a Commonwealth War Cemetery, at Martinsart in the Somme Valley. These words are also inscribed on the memorial to fallen soldiers at ANZAC Beach in Galipolli, and also on memorials in Canberra, Australia and Wellington, NZ. Today I’m thinking of all the mothers who have ever waved sons off to war and waited in almost unbearable anxiety for them to return – or not. I know this isn’t six words, but it’s my Saturday. On the back of the photo, my mum has written that it was taken on my 21st. 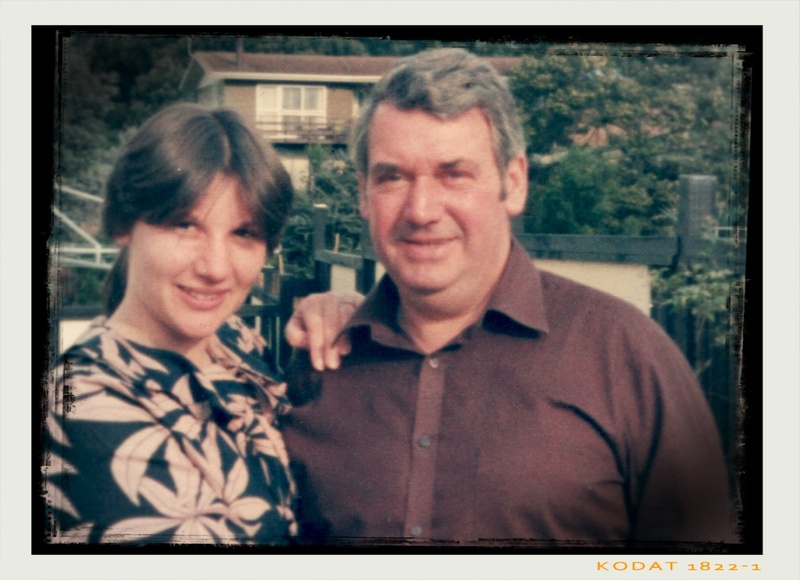 I don’t remember this, but am grateful for the photo – one of very few taken with my dad. 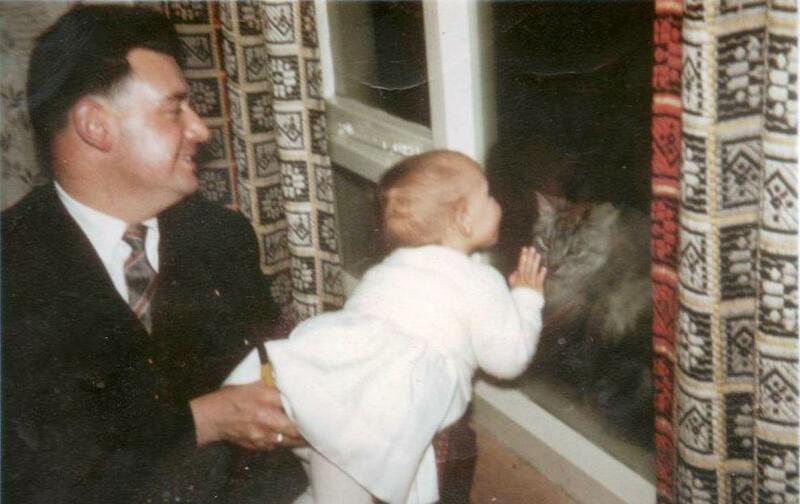 Me and my dad, Scotland, 1962. The life of a party, the man who could fix anything, and the best tablet maker – ever; I haven’t seen him for over seven years. A monument to the short life of Emily Keeling; murdered aged 17. Monument erected by members of her church and other well-wishers. Photo: Su Leslie, 2014. A headstone (tombstone, gravestone) is – for most of us – the only monument that will be erected in our memory. Whether it is a simple wooden cross, an elaborate marble angel, or anything in between, the placing of a headstone is an act of remembrance. The headstone of Emily Keeling stands next to that of her parents. It is weathered and damaged and the ground around it is broken and uneven, but the inscription is clear and tragically poignant. I discovered Emily’s story because of her monument. The Big T and I were wandering around Symonds’ Street Cemetery in central Auckland and read the inscription. Curiosity about that word “shot” sent me to Papers Past* to find out more. New Zealand even now is not a nation of gun-owners, and the idea of someone – especially a young woman – being shot in 1886 seemed not only tragic, but quite bizarre. Was it an accident? Or murder? It was an autumn evening and Emily was on her way to Bible Class. After shooting her, the man – Edwin Fuller – ran a few hundred metres to an adjacent street and fatally shot himself. Emily Keeling was a victim of domestic violence; another name on a too-long list of women attacked and killed by men who claimed to love them. It is shocking that Emily was so young, a teenager living with her parents. It is shocking that she died in the arms of her neighbours on the street where she lived. But for me what is truly shocking is that Emily Keeling died one hundred and twenty eight years ago but her story is that of countless women now; women who are still suffering and dying at the hands of their husbands, partners and lovers – past and present. Buried next to, but many years before, her parents. 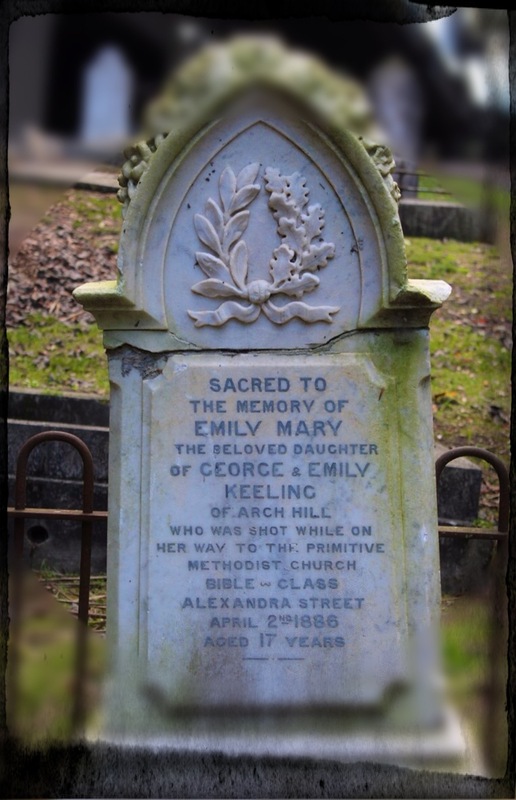 George and Emily Keeling (snr) grew old, robbed of their only daughter. Photo: Su Leslie, 2014. 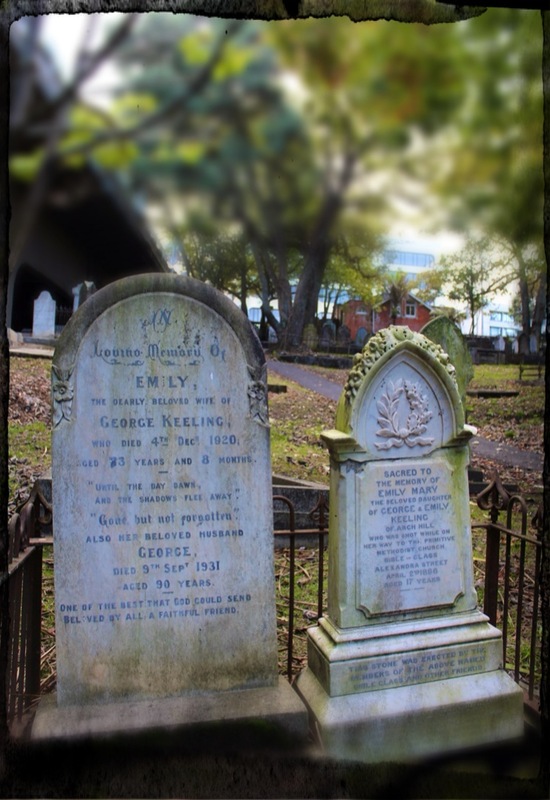 Today is the anniversary, not of Emily Keeling’s death, but of her birth; 18 April 1868. Had her life not been so brutally cut short, she might have married, had children, grandchildren and great grandchildren who would remember her. She might have become a teacher, a nurse, a businesswoman. She could have been one of the 25,000 women in New Zealand who signed the Suffrage Petition in 1893 and been amongst the first women in the world to cast a vote in a general election. Page 1 of the Suffrage Petition; signed by over 25,000 women. New Zealand was the first country in the world in which women gained the right to vote – in 1893. She may have joined – or been part of the formation of – the Society for the Protection of Women and Children (1893), or the National Council of Women, formed in 1896. We can imagine any number of lives for Emily Keeling, but she experienced none of them. New Zealand has a shockingly high incidence of domestic violence. In 2013 alone, the Independent Collective of Women’s Refuges helped 20,000 New Zealand women in abusive relationships. And if that number seems high, it represents only a small percentage of the victims of domestic violence. For this is a crime that is terribly under-reported. That’s twenty two names on headstones; 22 futures we can only imagine; 22 lives remembered in monuments to pain and violence and loss. I went to see Emily today; as I know a friend went on the anniversary of Emily’s death. I went in sadness; having read in the newspaper this morning that police going to tell a woman of her husband’s death in a car smash instead found her dead body. According to the news “Police are treating the woman’s “violent” death as a homicide and say it is linked to her husband’s fatal crash this morning.” This comes only one day after a man was charged with the murder of his estranged wife in Wellington, and a week after another man was arrested in Auckland for the murder of his partner. I would have liked to tell Emily that things have got better; that men don’t kill and maim and terrify women and children in the name of “love” any more. I would have liked to tell her that organisations like Women’s Refuge – which didn’t exist in Emily’s lifetime – are no longer needed now. So instead I’m doing what I can to make sure that domestic violence isn’t buried away as a “family matter” – something that can be ignored or downplayed. For me that means involvement with NZ Sculpture OnShore, a biennial sculpture exhibition that raises funds for Women’s Refuge. Established by a group of passionate, creative and highly organised women who began fundraising for Women’s Refuge twenty years ago, NZ Sculpture OnShore will hold it’s 10th exhibition in November 2014. Bernie Harfleet, 14, 2012. 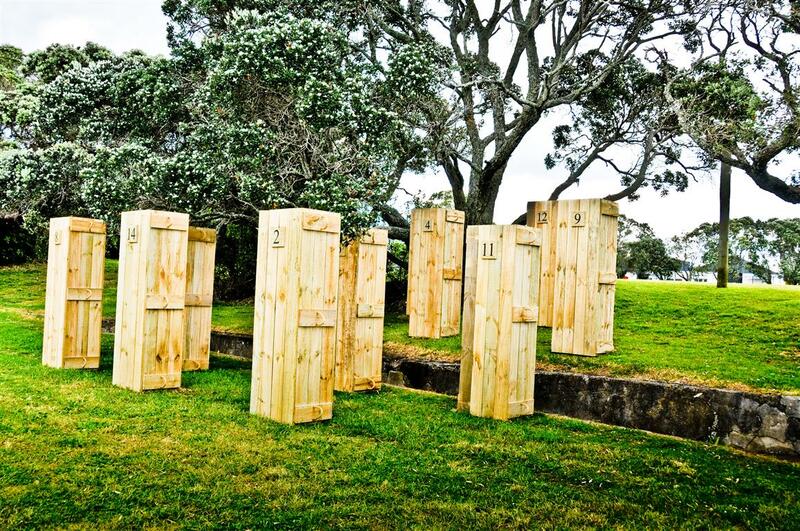 Exhibited at NZ Sculpture OnShore in 2012, each coffin represents a women killed in any one year in NZ by a family member. Photo Gil Hanly. Like many people, I’m doing what I can, so that one day I can visit Emily and tell her that truly, things have got better. Until then, if you would like to know more about the work of Women’s Refuge, click here. And if you want to know about a NZ Sculpture OnShore, click here. * Papers Past is an initiative of the National Library of NZ to digitise historic newspapers from all around NZ. Wanna be in my gang? 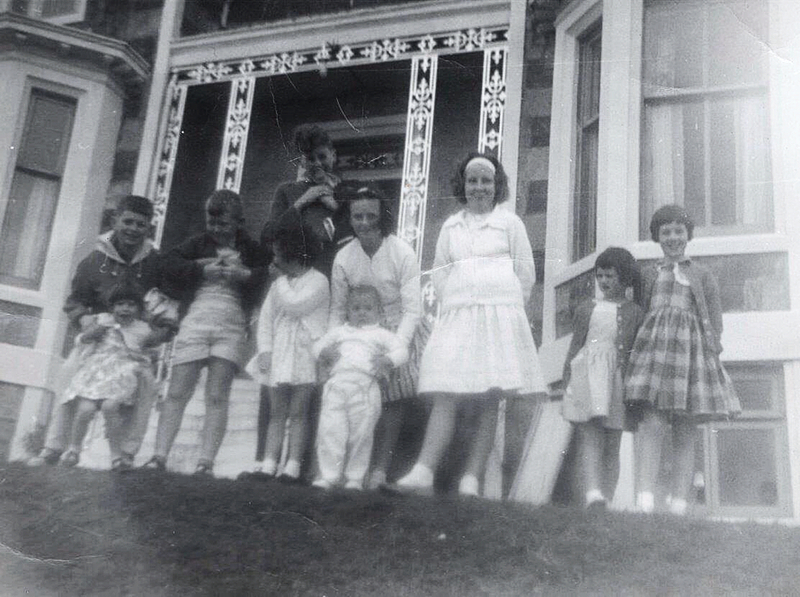 Children holidaying in Rothesay, Scotland, August 1963. I’m the toddler in white at the front. Photo: Ron Leslie, 1963. Since talking to my mum about the photo of my toddler self making a bid for freedom in Rothesay, I have been looking for the other photos she reminded me were taken on the same holiday. I found this one.